With a stay at Locanda Conterie in Venice (Venezia-Murano-Burano), you'll be a 1-minute drive from Palazzo Giustinian and 9 minutes from Municipal Tower of Mestre. With a stay at Locanda Conterie in Venice (Venezia-Murano-Burano), you`ll be steps from Murano and 4 minutes by foot from Palazzo Giustinian. This romantic hotel is within close proximity of Madonna dell`Orto and Basilica di San Giovanni e Paolo. Make yourself at home in one of the 33 air-conditioned rooms featuring refrigerators. Complimentary wireless Internet access is available to keep you connected. Private bathrooms with showers feature bidets and hair dryers. Conveniences include phones and desks. 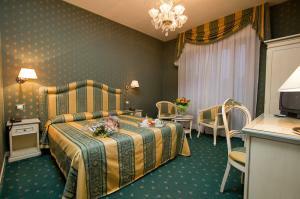 A tax is imposed by the city: EUR 3.5 per person, per night for adults; EUR 1.75 per night for guests aged 10-16 years old.